The deck is $30 plus shipping – $8 in the US, $26 for Canada, and $35 for other countries. Shipping is the same for one to four decks. The oldest known Tarot, or the oldest ancestor of the Tarot, depending on your definition, was described in a 1449 letter by Jacopo Antonio Marcello to Queen Isabelle of Lorraine, in hopes of gaining her favor. Paul Durrieu first discovered this letter in 1895. Franco Pratesi brought an accurate account of this letter to the attention of playing card historians in 1989, and in 2003 Ross Caldwell made a new translation, which brought it further attention. In the letter, Marcello described two decks that he was acquiring for the queen. Of the two decks, the older one was created between 1412 and 1425 for Filippo Maria Visconti (1392-1447), Duke of Milan from 1412 to 1447. 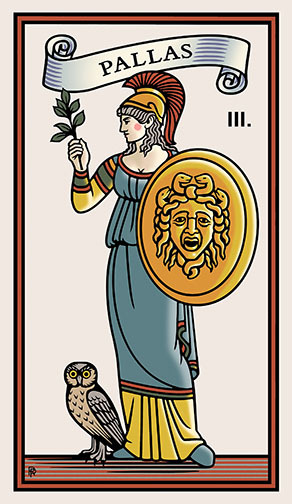 This deck had trumps that consisted of sixteen classical gods, and did not follow the allegory that we now consider standard for a Tarot. The deck was designed by artist Michelino da Besozzo, working with a plan created by Marziano da Tortona, the Duke’s secretary, tutor, and astrologer. This is the oldest known deck to have trumps and, therefore, by my definition, is the oldest known Tarot. Eagles, representing the life goal virtue, were assigned Jove, Apollo, Mercury, and Hercules. Phoenixes, representing the desire for riches, were assigned Juno, Neptune, Mars, and Aeolus. Turtledoves, representing the goal of chastity, were assigned Pallas, Diana, Vesta, and Daphne. 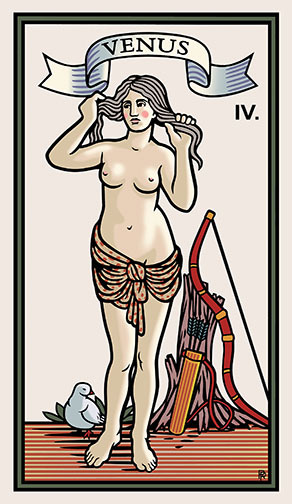 Doves, representing the desire for sensuality, were assigned Venus, Bacchus, Ceres, and Cupid. The question of profundity in a game was also addressed in Marcello’s letter. The letter recounted the rhetorical question put to the Duke by the deck’s intellectual designer, Marziano, who asked if it is fitting for a serious and virtuous man such as the Duke to spend time playing a card game. Marziano answered that it is fitting if the game is equally serious and virtuous in the philosophy that it presents. He felt that his game met that standard. As stated above, Marziano wrote a great deal about the symbolism of the deck, but less on how the game was played. 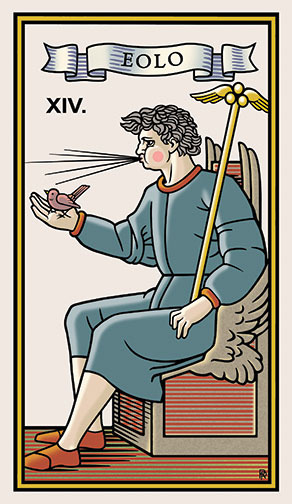 There is evidence to suggest that even at this early date, playing cards were used for divination, and Marziano’s concern with symbolism and his use of birds, which are connected with ancient augury, suggests that besides a trick-taking game he may have intended a divinatory use for the deck. No cards exist from this deck and the originals were most likely hand painted and gilded like other Milanese 15th century decks created for royalty. I have redesigned the deck as if it became a standard deck that was later reproduced in woodcuts and hand colored. My images for the cards are based on Marziano’s descriptions as translated by Caldwell and on the woodcuts found in the 15th century Hypnerotomachia Poliphili, early printed cards, as well as other Renaissance sources. In the future, Caldwell will author a book to accompany the deck, which will be sold separately. The deck measures 4.75″ by 2.75″ and it is now being printed. You can preorder the deck through my campaign on Indiegogo or by contacting me in an email. You can also order an archival art edition of the 16 divine trumps. I will print it on cotton paper, hand cut each card, and create a portfolio case for the deck. These are $200 plus shipping – $8 in the US, $26 for Canada, and $35 international. 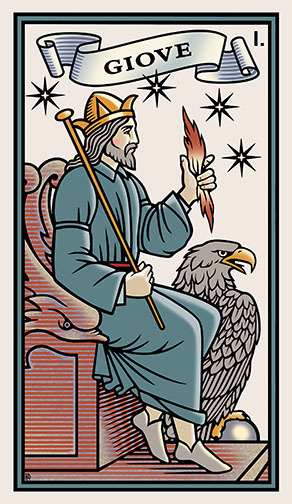 I have had Robert Place‘s Marziano Tarot for quite awhile, and just this morning I realized how powerful it is for one-card guidance. 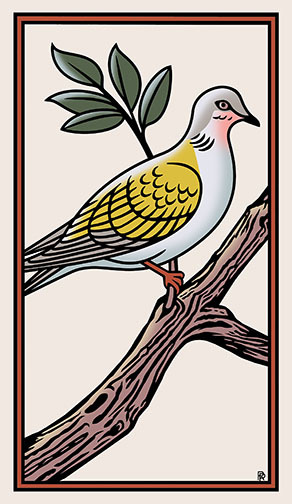 The deck is styled as an Augur’s deck, with four types of birds as card suits. 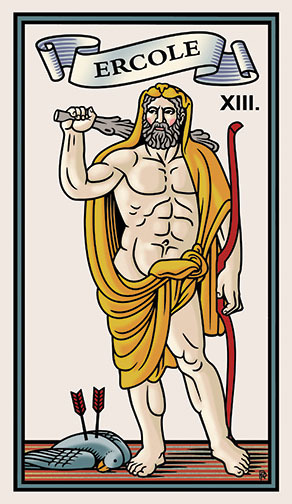 The deck also includes depictions of some of the major Roman deities. I had tried using it for divination, and it’s as enjoyable as any other divination deck. Very similar, in fact. Today, I thought to ask a question of guidance, a “what should I do” in a particular situation. I decided to select only one card. If the card was a deity, I would consider appealing to that deity for guidance. 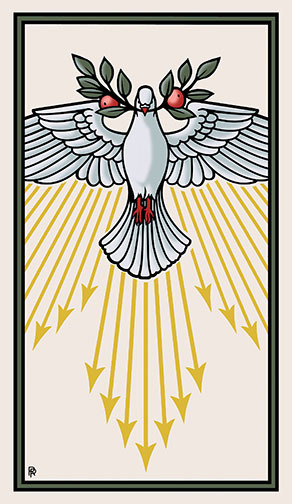 If an Augury card came up, then I would look to see what the meaning might be in the “little white book” (a.k.a. “lwb”) that comes with the deck. To my surprise, I did receive an Augury card. 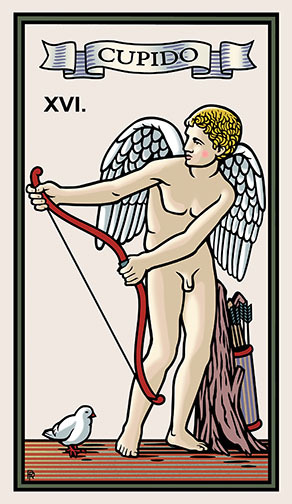 After considering the meaning of the card, the direction was very clear. Crystal clear, in fact, for an issue that had been concerning me for quite some time. I felt, oddly, like a participant in an actual Augury divination…despite using card depictions of birds and not “real life” birds. I do know that Mr. Place does a lot of research for his decks, and I had been seeking a “humane” method of Augury for the purpose of exploring Roman Reconstructionism in an Animal-Friendly, contemporary sort of way. 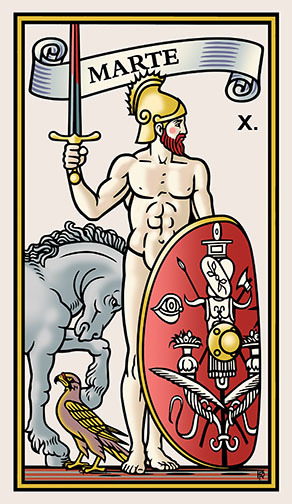 Although some might argue with the Auguric interpretations in the “lwb”, Mr. Place will probably have very accurate explanations for each card. As for “humane” Augury, this is second nature to my Wiccan followers, yet somehow an elusive concept for some organizations in the Reconstructionist path. However; ancient practices evolved over time; this is particularly evident in ancient Rome, which went through numerous phases over the course of its reign. I would like to recommend that my followers who are of the Reconstructionist path consider working with this deck, for Augury practice, and relay back with comments how well it may or may not work. To work with a deck, rather than with antiquated Auguric techniques, might correspond very well with evolution from the bronze/iron ages into the age of self-publishing and printing for the masses. Keep in mind, I’ve been using cards for divination and guidance for more than 10 years, and I have a few credentials as well as a professional practice in cartomancy. It might take numerous times, over a period of months, to begin to reach the results you seek, and patience would certainly be a virtue. However; appears to be a great deck, in my opinion, for simple, one-card guidance, with the theme of ancient deities and Augury. Highly recommended for reconstructionists who want to learn & practice Augury with the convenience of contemporary tools of divination/guidance. Sara James is an Alexander Technique Teacher and Mystery Scholar from the Jungian based Pathways Mystery School. She lives in San Francisco. 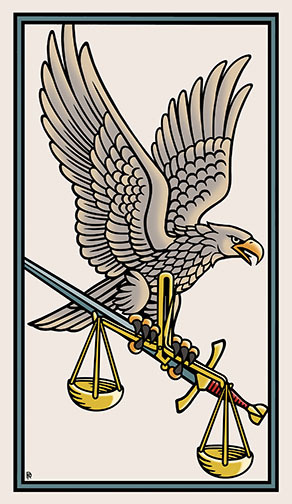 I can understand why these cards are hard for some people to know what to do with, they are in my opinion very different, they are not a seven and threefold allegory but a four and two fold allegory, they also have Eagles, Doves, Turtledoves and Phoenixes instead of Swords, Cups, Coins and Wands. I my imagination Doves fly, cups fall over. There are a lot of differences and I believe it can be hard to relate some of it to what we are used to, but I’ve been reading them using a different set of correspondences that I have picked up from twenty years of working in the realms of debt psychology, somatic work, alchemy and mystery school studies. There are a couple of things I’ve worked with that have been particularly valuable. I’ve come to look at the cards as 600 year old personality theory, that could possibly do a better job than most things out there today, especially if it requires a test witch is the main reason many people I talk to think personality testing is bogus. VD is a technique created by Jungian Therapists Hal and Sidra Stone. It has to do with learning how to make conscious inner bonding patterns that for the most part are running our decision making on a moment to moment basis, and learn how to stop and make more conscious decisions based on a more mature inner dynamic. It’s about inner relationships and how they reflect outer relationships. When I first got the cards and started working with them, I was facilitating a class in Voice Dialogue. I became really fascinated with the idea of the way the cards are divided into Desires and Goals. Much of what one does with Voice dialogue is to uncover unconscious desires and drives that are fueling our course of action or goals. I started to have a theory that the cards could be used for the same thing, or better yet that the cards and technique could enhance one another. It actually, at least in my own work it’s pretty effective. Let’s talk about the Allegory, the biggest difference between this 16 card allegory and the standard 21 card is Relationships. Every single character has some kind of relationships with one or more of the other characters, Zeus is pretty much everybody’s dad, brother, uncle, or grandpa. This deck isn’t so much about the holy grail as it is like a family barbequ, when I look at the cards in order I think of the wedding party that started the judgment of Paris because Hera, Athene and Venus are all the first three characters along with Zeus who is the owner of the backyard I would imagine. some of the mythology around these relationships is pretty intense, Juno and Hercules for instance, If someone pulls these two it’s kind of interesting to think about what might be going on in their life. Could a critical mother be blocking the person from making their own decisions? Or do they need some kind of initiation force to help them grow into a mature man? Could depend on where the cards land, someone actually pulled these two cards and as a matter of fact he had a critical mother voice that was pretty debilitating and he felt like he could never be good enough. He has a degree in design and can’t seem to find a job although he’s really qualified. He’s kind of sad in the way Hercules can be sad cause his inner animus is a little out of control. What is a bonding pattern? We all have bonding patters that go back and forth from power and vulnerability, in voice dialogue part of the study is to make a figure eight image like the one in that often gets displayed with the two of Coins and put it on it’s side OO kind of this. On one side you put a vulnerable voice like a vulnerable child and on the other side up put a power voice, say an unemotional father – usually what happens is that you find the strong voices are protecting the vulnerable voices. Sometimes the vicim voices become the power voices, think about our US president and his gaining power by getting people to sympathize with him by saying things like “It’s a witch hunt” or “The Press is being unfair” actually this pretty dangerous to a free and open society – but it’s the kind of thing that can happen when power and vulnerability are out of whack in someone. if you are a Donald Trump fan, I’m sorry if this seems bias, but it’s the best example that I could think of that (unfortunately) everyone would recognize in an attempt to describe something pretty complicated. Mythology as an expression of the collective unconscious is a great way to reflect these archetypal bonding patterns and probably one of the reasons why so much of the great classical theater, poetry and philosophy was so powerful and still pertinent even today and probably will be off into the future long after we are all dead. 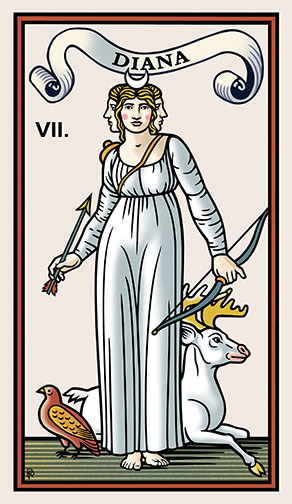 I’ve found that the cards have a lot of different levels – they have their god category, like the sun (Apollo) and the Moon (Diana) but they are also Brother and Sister the Alchemical marriage, an equal partnership between a man and a woman sol and Luna.. the list could go on. You can also look at cards through the lens of developmental stages like child, adolescence, middle age and old age. Often times it’s a great in a reading to find out where you need more of one thing and less of another in your self development. 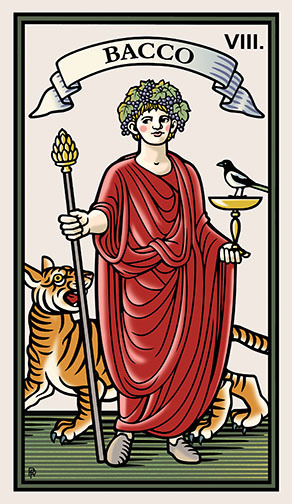 I myself did a reading that was really powerful where I pulled Bacchus (Un reason) and Apollo (reason) and I could see the place where I tend to have too much chaos (Bacchus) and not enough focus (Apollo) – someone else might need more Bacchus, they are just too uptight. We tend to have certain parts of us that are more developed than others, and we tend to repress parts of us and these things tend to come out in the form of problems in our lives. The cards are a great way to explore these problems and find resolutions. I haven’t talked about the Birds yet, and I’m not going to dive deep into Arguary, but like I said earlier, my thoughts are that I think there are some major differences where it can be a good idea to approach the birds in a different way, Doves fly cups fall. A couple of ideas I’ve gotten have come out of a book I have by Michael Gelb called “How to think Like Leonardo da Vinci” Leonardo, of course was a man of the time frame that the cards came from and he wrote a lot of journals and every day he would participate in a process he called “curiositia” where he would ask questions. He might pick a turtledove flying around his yard for instance and ask..
Where does it fly to? How does it slow down? Does it have a mate? Does it stay with it’s mate forever? Is it’s mate waiting for him in a tree somewhere or did a dog eat it? Ive found a lot of fun ways to work with the birds, including going out in nature and watching birds, creating a song list – there are tons of songs about Doves Eagles Phoenixes and Turtledoves. Different kinds of music fit different birds like Eagles: – wrap and Country – Turtle Doves: Singer Songwriter – Doves Rock and Roll and Jazz – Phoenixes – Punk, Metal. You might find different inspirations, I”m sure you can come up with a song list for Cups Swords Wands and Coins but I don’t know that it would be as easy or as fun. 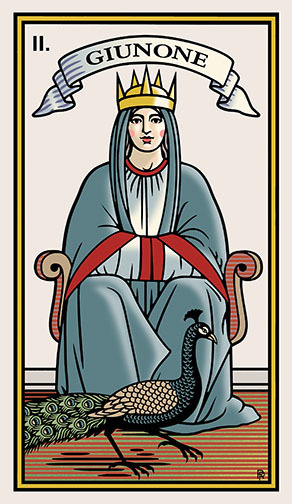 In Jung’s Personality Theory he divides the personality into four parts – feeling, Intuition, thinking and sensation – the cards are divided up into The Goals of Chastity and Virtue and the Desires of Sensation and Riches. I think there are correlations here – the main idea is that we have a tendency in life to move more toward one than others, the point of aware of ones tendency is to move toward the unfamiliar and learn how to express true empathy. In learning the Tarot I’ve noticed that a lot of people emphasize either intuition or thinking but very few people I’ve noticed really utilize feeling or sensation. We are taught in our education to trivialize feeling and and are told to sit still and thus not experience sensation at all most of the time. In my school I remember feeling like the only ones that should be moving at all are the athletes and even then they had better win a ball game or they were useless. I’ve studied The Alexander Technique for twenty years, it’s a somatic technique that helps you to learn how to free your head neck and spine and create more ease and flexibility. When I work on sensations I often step into a posture that a character in a card is holding and see what see what feelings and sensations come up. These cards really require learning on all four levels. They bring together art, music, divination, story telling and – maybe even game playing. My imagination is that the cards were possibly intended for some kind of character building game. The academics often say TAROT was originally “just a game” as if trivilizing games (The gaming industry is trillions of dollars by the way). Maybe divination is a game, but an important even serious game, and maybe these cards are a great clue in how the people of ancient times played that game. If you have any questions or anything to add to this conversation I’d love to hear it. I really love these cards and I think they can be powerful and even life changing. This is one project I’m anxiously waiting for to be brought to life. Fascinating history… thanks for this! Quando será publicado? Belíssimo trabalho. Wonderful helping me keep abreast of tarot’s history. Wonderful. I’m looking forward to this. Do you see any connection with the so-called Tarot de Mantega? Well, they are both examples of the Renaissance fascination with Classical culture. Gorgeous. And birds in ancient augury (and messengers in general), of course. Thank you! I just received my copy today. Thanks so Much. I Want to know if there is a PDF or Word copy of the Little White Book ? you can down load a PDF of the Alchemical Little White Book on this website. Look for it in the menu at the top. Good evening. I’ve got The Raziel Tarot, The alchemical tarot and the burning serpent oracle. Love them all. Please tell me how can I buy the Sevenfold Mystery and The Marciano Tarot. I live in Portugal. I love your work, knologe and art. Those Tarot decks are $30 each and shipping to Portugal is $35. Send me your email address and I will send you a PayPal invoice for the order. Thank you from the heart. 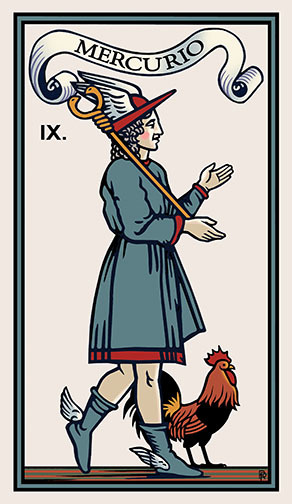 I want to buy Marziano tarot. Fascinating deck. Absolutely love that you came up with your own historical recreation and that it is true to the original concept. I may have to get it at one point. I’ve got a really loaded question about this deck: Eolo and Daphne strike me as rather peripheral characters in Greco/Roman mythology. Do you have an idea on why they would be included as opposed to say Saturno/Kronos or Hades/Pluto? I feel like I want a Death and/or Hermit type archetype amongst the cast of main characters and I’m not seeing it here. 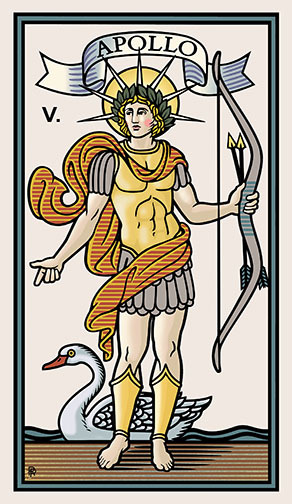 Is there some card combination amongst the trumps that would have a Saturnian or Plutonic theme? Do you think Daphne and Eolo are essential to the structure of this type of deck? I think that Ercole, who has killed his Stimphalis bird and wears a dead lion, symbolizes death as well as strength. Remember that Marziano wanted four of each of the gods to fit with one of the four suits, representing, virtue, riches, chastity, and sensuality. Eolo fits with riches, and Daphne is an obvious fit with Chasity. This look amazing! I really like Greek/Roman gods and goddesses as triumphs! But, I was wondering, what’s the meaning of the crane eating the snake in the backs? It is a symbol of protection.